Distinctive and innovative products just keep flowing, as the craft beer revolution shows no sign of going flat. Scotch whisky is the stalwart of the Scottish drinks industry, but hot on its heels is Scottish craft beer which is rapidly gaining popularity. With our world-class barley and crystal clear water, Scotland’s beer industry is booming. Scotland’s craft beer boom is part of a wider UK trend, due to former chancellor Gordon Brown introducing a progressive beer duty relief in 2002 which made small producers more competitive against the mass market brewers and with an average of three new breweries popping up every week, the craft beer revolution shows no signs of slowing down. The craft brewing industry in Scotland has been a huge success story in recent years providing opportunities for companies to produce a wide range of distinctive and innovative products that are exported all over the world. We’ve seen innovations using whisky casks to age beers or flavouring them with heather, giving a unique edge to Scotland’s products. The Brewers’ Association of Scotland (TBAS), formed in 2015, is a membership organisation and Scotland’s leading sector development agency for beer, promoting the rich provenance, variety and authenticity of Scottish beer both at home and abroad. There are currently around 150 breweries in operation or in planning throughout Scotland, a number which has almost doubled in the last few years and TBAS recently took 16 members to Craft Beer Rising 2017 in London. Scotland’s beer industry is extremely diverse, try a gluten-free craft beer from Bellfield Brewery, the UK’s first dedicated gluten-free brewery or the brand new 9%ABV American Brown Ale, The Scorpion & The Frog, from Williams Bros. Brewing Co. both of which are Edinburgh brewers. Fallen Brewing, from the South West Highlands, have two new collaboration beers available: Steamer – a 4.6%ABV coffee oatmeal Pale made with Avenue Coffee and Thirst Craft and Bee Line – a 6.8%ABV pear, honey and guava Saison made with Dead End Brew Machine. If these beers are too strong for you, try the 3.5%ABV Session American Pale Ale, Sunshine on Keith, from Spey Valley Brewery. 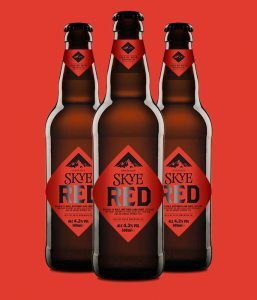 Why not try Isle of Skye Brewing Company’s Yer Ben, a collaboration made with Michelin starred chef Tom Kitchin and named after Tom’s grandfather. If none of these take your fancy or if you prefer alcohol free, try Innis & None from internationally renowned Innis & Gunn, a brand new 0.0%ABV pale ale containing vitamin C and ginseng, which is sure to boost the immune system and improve energy levels. So, next time you are eating out or browsing the beer selection in store, why not try a Scottish beer? Visit www.tbas.scot or follow @TBAScot on twitter to find out more about Scotland’s incredible brewing industry.